The role of the instructional designer first surfaced during World War II as experts in psychology and academics to create training and assessment materials for troops. Since then — and especially since the spread of digital learning in education — the ranks have only grown. In higher education, one 2016 estimate pegged the "minimum" number of instructional designers employed by colleges and universities at some 13,000. But, as a new report from the Online Learning Consortium pointed out, "There is still a certain mystery surrounding who instructional designers are." 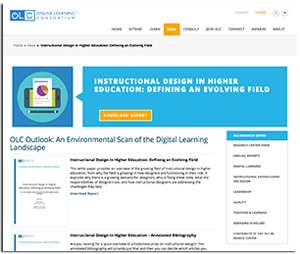 "Instructional Design in Higher Education: Defining an Evolving Field" seeks to clear up the mystery. The report is the second in a series to examine aspects of the digital learning landscape by doing a literature survey of existing research. The first report looked at accessibility. The series is being produced by OLC's Research Center for Digital Learning & Leadership. According to authors Elaine Beirne from Ireland's Dublin City University and Matthew Romanoski from the University of Arizona, there is "no universal profile" for an instructional designer, and the path to the job may come through teaching in higher ed, working in technology, holding an academic research role or having a graphic design background. Even with this variety, the goal of the job is consistent across the board: to improve student success. In this, collaboration with faculty is the "top challenge." Oftentimes, instructional designers have to overcome the idea that online learning works "crock pot style" (set it up and "forget it"), or they face instructor concern that a given course will become more mechanized and lose its personal touch in the design process, leaving students adrift as little more than an ID number. Those obstacles are being knocked over instructor by instructor. For example, at U Arizona, designers begin their work with faculty members by asking about how they teach concepts in their traditional courses, and then using that as a starting point for discussing how those same approaches can be translated to an online class. As the field evolves and the importance of the instructional designer role grows, suggested the authors, more effort needs to be put into sharing research and best practices, improving in training and development processes, outlining industry standards for the field and identifying practices for improving career pathways. The report is openly available on the OLC website, along with other reports from the series.